Fortunately our house was built with a good north-facing aspect for good winter solar energy gain (I'm in the southern hemisphere; south-facing for you northerners). There is a storm-water easement running diagonally across the block, which restricted the orientation of the house, otherwise I suspect the original owners would have had it turned 90 degrees to face the street. As our kids grew we found the small house (about 10 squares, or 100 square metres) getting smaller, and in 1988 I started on designing an addition. I had done a lot of reading about passive solar design, and had done a fair bit of airconditioning design work in my job, so was very familiar with thermal flow concepts. I determined that the addition to the house would be a passive solar design, to get the maximum benefit from the winter sun and still moderate the fierce heat of summer. Where I live in Australia we can hit 40 degrees Celsius in summer, and high thirties are common. In winter it can get down near freezing. Here you can see the result. This is the northern aspect of the room I built on the western end of the house. The entire northern wall is glass, with a solid brick wall, painted black, inside it. The basic design is known as a "Trombe" wall, http://en.wikipedia.org/wiki/Trombe_wall - the bricks act as both solar absorber and thermal storage. You can also see the large clerestory window above the Trombe wall. 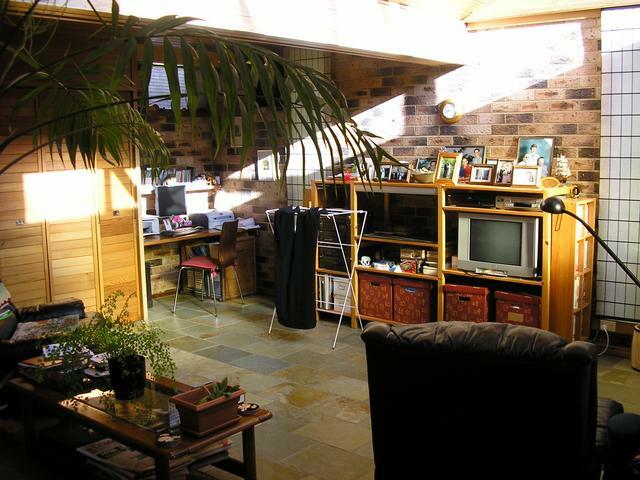 This lets direct winter sun into the room, where it is absorbed by the stone-tile covered concrete floor and the walls, as well as plenty of light. Here's a shot of the clerestory from the inside. Notice the louvre windows for summer ventilation. 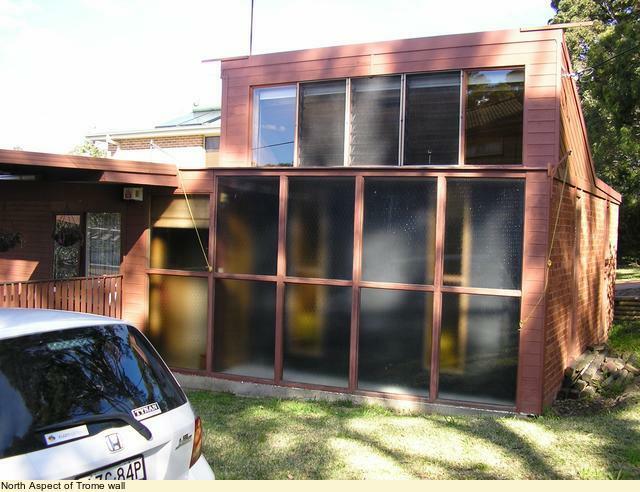 The window is covered by heavy roller blinds at night or on hot summer days. 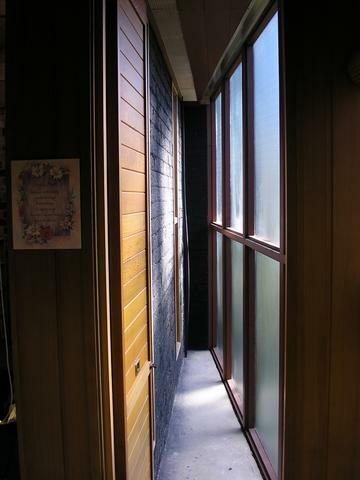 I made the thermal space between the Trombe wall and the glazing big enough for maintenance access. Here's a shot through the narrow door into the space. Winter temperatures in the space go above 40 degrees Celsius. Along the ceiling next to the wall is metal mesh that allows hot air to rise into the main room, via some timber flaps that get closed in summer. Here's the Trombe wall's inner surface, and you can see the two slit windows of amber obscure glass I put in to give a greater sense of light in the room. In mid-winter the sun at noon is only about 33 degrees from the horizontal, so the direct sunlight penetration is very good, as you can see here. In contrast the mid-summer sun is about 11 degrees from the vertical and little sunlight gets in. Very well indeed. Though the house is now bigger, it needs less heating and cooling than the original house did. 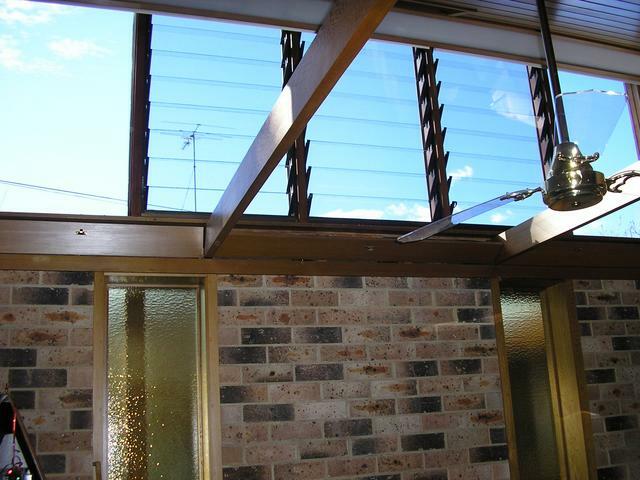 The heavy brick construction of the addition has a stabilising effect on the entire house (the outer walls are double-brick with polystyrene insulation in the cavity). It is a very comfortable and relaxing room, with lots of light and natural brick and western red cedar paneling. Summer ventilation is very good. 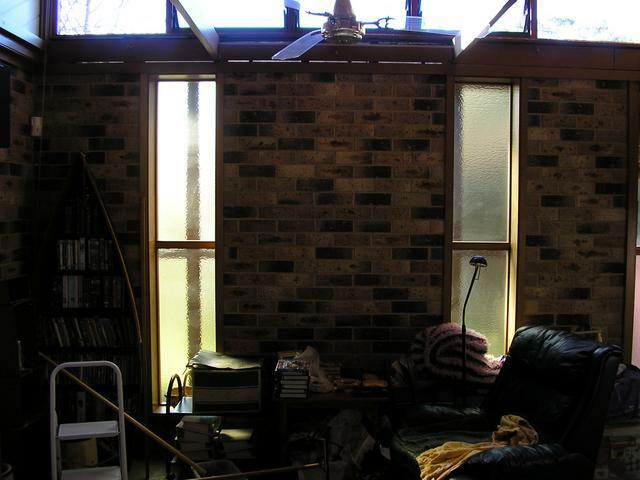 The louvres allow the warm air to rise out of the room, pulling air from the rest of the house, which had poor cross ventilation before. I do, however, rig up two 5 metre triangular shadecloth sails over the clerestory and Trombe wall in the summer. Originally it was to cool the solar space so that I could get in there for maintenance (painting of the timber) as it was too hot summer or winter. One thing I would change if I did it again is the timber frame on the glazing. The western red cedar has actually charred slightly! I think it is the oil rising out of the hot timber and charring on the surface. I have since painted it with a timber coloured acrylic (latex) house paint and that has solved the problem.